I’ve been living through a terrible experiment for the past few months. And here is a summary of the results. Doing “nothing” is easier said than done. 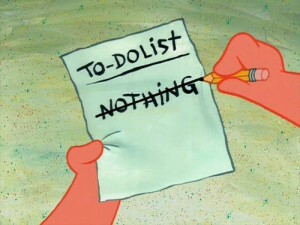 The idea of doing nothing after a while of doing everything is extremely appealing. But apparently, there is no joy in doing nothing. When we have over-scheduled ourselves, we constantly think about all that we would do once our work gets done and we have free time. But once that moment of freedom arrives, all our desires vanish. The list of “things to do when free” becomes another “to do list”. We end up doing nothing and soon we get bored enough to wish we had more work to do. Proverbs like “the grass is greener on the other side” flash in our minds and the hunt for greener pastures seems endless. Doing nothing is extremely difficult and boring on all counts. We are addicted to doing things with an aim or purpose and there is no apparent purpose in doing nothing. It is almost like we are addicted to constantly thinking about the past, future, and everything else in the middle. And once we stop thinking, the empty mind sure does become the devils playground. Existential questions start popping up – What happens when we die? Why does God permit evil? What’s the meaning of life? We realize that there is little meaning to life other than what we give it. We realize that the reason we hate to work is because while we work so hard to get better, richer and more successful, we have forgotten how to do something because we enjoyed it. This old Italian saying stands for “the sweetness of doing nothing”. It is not about being idle or lazy, but in a state of non-activity which enables us to experience life to the fullest, to love and to be loved, to notice the simple joys of life. With this epiphany comes a state of new-found bliss. Greener grass becomes visible on both sides. And as we look around, we find that the world is no more a rat race, but an amusement park filled with joy rides.